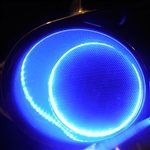 Add some custom lighting to your bike with LED Speaker Lights. The rings are made to be placed behind your speaker and then you can let the lights speak for themselves. An easy way to make your bike custom!